So is he a "Santa Claus" or is he a "Father Christmas"? I never thought much about this until my friend Louise (an American) suggested there was a difference; in the ensuing discussion, it seems my guess did not gel with her view. I think she told me that Father Christmas is the traditional old chap and that Santa Claus is one in red with the white trim. Anyway - which ever he is, I'm sure he'll make a nice little seasonal knitted toy. 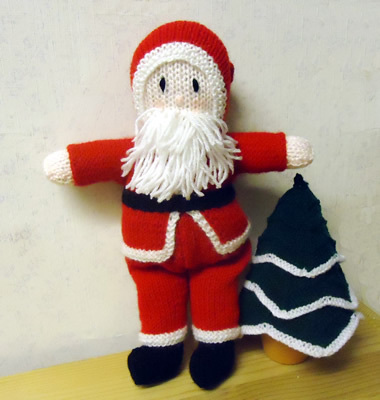 This example knitted by my friend Jennie, and if you live around Ewell in Surrey in the UK you can find her work for sale at local craft fares . Note that: the body is knitted with the yarn doubled (2 strands held together), and the clothes are single. With white yarn (W) and 3mm needles and yarn used double, cast on 20 stitches and work 3½ inches in stocking stitch (1 row knit, 1 row purl). Shape shoulders by casting Off 5 stitches at the beginning of the next 2 rows. [10 sts]. Work 2 rows straight for neck. Now increase 1 stitch at each end of every row until there are 18 stitches. Work 14 rows straight for back of head. Now decrease 1 stitch at each end of every row until 8 stitches remain. Make another piece the same using but changing to pink (C) for the neck and face. Join the two halves together and stuff firmly. With yarn C, cast on 14 stitches, and work 1 inch in stocking stitch, ending with a purl row. Break off C.
Join in W, and continue until work measures 2½ inches. Fold in half lengthways and join seam, leaving top open for stuffing. Stuff and sew to body. With yarn B, cast on 24 stitches, and work 1 inch in stocking stitch, ending with a purl row. Work across these 16 stitches for 1 inch, leaving 8 cast-off stitches for toe of boot. Break off B. Join in yarn W, and continue straight until work measures 3½ in. Fold in half lengthways and join seams, leaving top open for stuffing. Stuff and sew to body. For the left front: with yarn W, cast on 16 stitches, and knit 4 rows. Break off W.
1st row: k14 R, k2 W.
2nd row: k2 W, p14 R.
Repeat these 2 rows until work measures 2½ inches, ending with 2nd row. Cast on 10 stitches at the beginning of the next row for the sleeve, then work 1 inch straight on these 26 stitches, ending at the neck edge. Cast off 7 stitches at the beginning of the next row and slip the remaining 19 stitches on a length of wool or stitch holder. Work the right front to correspond, reversing all shaping. With yarn R, p19 stitches from the from right front, cast on 10 stitches, then p19 from left front. Cast off 10 stitches at the beginning of the next 2 rows, then work 2½ inches, finishing with 4 rows of garter stitch in white (W). Join side and sleeve seams of coat and fit on body, then join the front edges in white from neck to waist. With yarn W, cast on 30 stitches and k4 rows. Break off W.
row until there are 36 stitches. Continue straight until work measures 5 inches from the start. Join seams and fit on body. Attach garments to body stitching round neck, wrists, waist of trousers and top of boots. With yarn W, cast on 36 stitches, and knit 4 rows. Join in R, and work straight in stocking stitch until piece measures 3½ inches. Then k2tog at the beginning of every row until 4 stitches remain. Fold in half lengthways and join seam from point to start of shaping. the rest of the hood round the neck. Taking photo as a guide use blue for eyes and black for eyebrows and nose. Make moustache and beard with loops of white, sewing in position. With yarn B, cast on 4 stitches, and work 5 inches in garter stitch, (every row knit). Cast Off. Sew belt in position around the waist. With white (or any colour of your choosing), cast on 34 stitches and work 3 inches in stocking stitch. Cast off. Fold in half, then join side and base. With double yarn (or make a 2-ply twisted rope) gather up sack and sling round shoulder and under arm. 2 oz red (R), 1 oz white (W), and small amounts of pink (C) and black (B); scrap of blue for eyes. No tension is stated (as it's a toy so only consistency matters) but a classic 4ply knits to a tension of 22 sts x 28 rows to 10 centimetres, (4 inches). Using the yarn double will produce more like a worsted tension of about 20 sts to 4 inches. However note that this pattern knits the doubled yarn on relatively fine needles to produce a dense fabric so the tension may come out tighter than that. The original yarn specified was Patons Purple Heather 4ply. Depending on what era you purchased it in, it could be pure wool or a blend. Acrylic yarns tend to have a wide colour range, robust qualities, and are reasonably priced, thus can be very suitable for hard working toys. Robin make a Premium Acrylic available in 25g balls which can be useful for toys.